Roses in Winter, a photo by megan_n_smith_99 on Flickr. The watercolors are Daniel Smith, the paper is Arches and the ink is a Pitt Pen. I've been feeling a bit bleak, so maybe I am painting bright colors to try to cheer myself up. Garrison Keillor says February is the longest month. I'm working on another painting and a large pen and in drawing so I will have more to show you soon, though lately I've not felt like I had a lot to say. I hope a picture really is worth 1000 words. in progress, a photo by megan_n_smith_99 on Flickr. i took this right by the window which goes to show you what it's like living in seattle. aka not terribly light. anyway, this is too big for the scanner. the paper size is 16 x 12" and this is zoomed in on a portion of the drawing. i just did this while listening to an audio book yesterday. 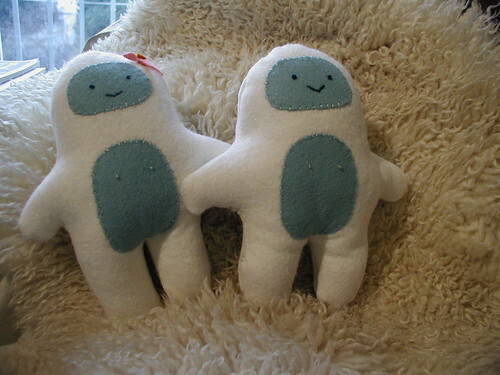 Yeti Dolls, a photo by megan_n_smith_99 on Flickr. I managed to get the elusive Yetis to pose again. Need to try outside. When we both agree it is warm enough. They think 36* is warm enough and I do not! In the Kraken's Garden, a photo by megan_n_smith_99 on Flickr. The colors are even more vivid in person! I painted this while listening Harlan Ellison reading Jules Verne's 20,000 Leagues Under the Sea. Birdhouse in your Soul, a photo by megan_n_smith_99 on Flickr. Tea Party, a photo by megan_n_smith_99 on Flickr. This is a new painting I finished a couple of days ago and it is available on Etsy. I think it would be quite fetching hanging in a kitchen. I've also been listing some more of my beaded houses on Etsy, if you are interested. And some yarn on Ravelry. My Ravelry user name is megannoel. Now I should go make a cup of tea! 100707bead1, a photo by megan_n_smith_99 on Flickr. 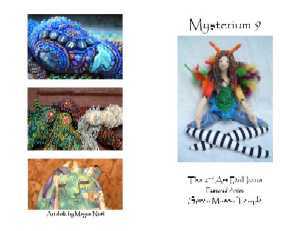 In 2007--2008, I joined a group of artists facilitated by Robin Atkins, in the The Beaded Journal Project. We each created 12 beaded journal "pages" --though I always knew mine would be hung on the wall and not bound in a book. These are my beaded journal houses. 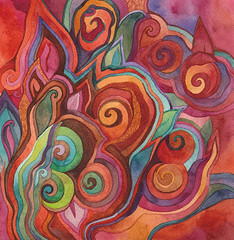 In an abstract way each documents my thoughts, my feelings, and pieces of my history. Each house is 5.5" high. I've started listing some of my houses on Etsy. I am just keeping a few of my favorites. I will be listing a few beaded dolls soon as well. Enjoy! Dreaming Spires, a photo by megan_n_smith_99 on Flickr. This is my newest painting on Etsy. Lately I've been working smaller - It's been a while since I did anything over 8 x 10" but I've been wanting to get back to that. The colors are even more vibrant in person. John Fowles, Robert Graves, Evelyn Waugh, Lewis Carroll, Aldous Huxley, Oscar Wilde, C.S. Lewis, J. R. R. Tolkien, Graham Greene, Phillip Pullman, Percy Bysshe Shelley, John Donne A. E. Housman, W. H. Auden, T. S. Eliot, Margaret Thatcher, Tony Blair, Stephen Hawking, Richard Dawkins, Albert Einstein, Edwin Hubble, Erwin Schrödinger, Hugh Grant, Kate Beckinsale, Dudley Moore, Michael Palin, and Terry Jones. Art Zines, Sleepless, Typos, and My Twin Sister. I am working on a new painting that I hope I finish later today. I'm pretty happy with it. I wish I did not need to sleep so much so I could paint more, though actually I do like naps so I suppose I would miss them. I have been listening to Nancy Kress' Sleepless series, about a future with gene mods where some people don't need to sleep, and it's quite fascinating It is the kind of science fiction that actually makes you think, which is always good. As an offset to the escapist fantasies I also like to read, I guess. I've listed some art zines on Etsy! I suppose some of you know that I used to publish several zines. They were: Mysterium (9 issues), La Luna (I forget- maybe 4 issues?) and there were some one-offs, lncluding a selkie zine and a crow zine. Several of these are now on Etsy. This is the front / back cover of Mysterium issue 9, which may have been my favorite issue, though it has at least 1 typo. How do those slip past? It made me feel better that my twin sister recently blogged that she sometimes makes typos as well. I actually was a bit surprised! I did not think she was perfect but I thought her copy was. 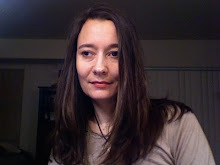 If you want to visit my twin sister's blog it is Telling Secrets. It's quite a different sort of blog than mine. My sister works in the missions field doing research / education / writing / editing. (Actually I wonder if she would consider that an apt description of her job, but it's how I see it.) She gets to meet lots of people around the country and sometimes around the world. She's been to some fascinating places that are certainly off the beaten path. I guess when she chose to go to Haiti as part of a medical mission when she was only 17 the die was cast. She lives quite a different life at times than most of us in America can imagine. She was telling me the other day about when a toddler she was living with in central asia ate all her cough drops and you could not get them where she was. The things we take for granted! 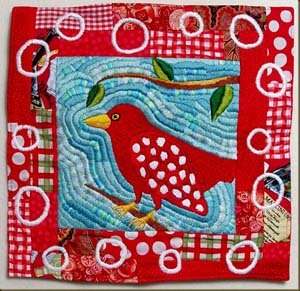 Visit Andrea's blog to see a larger image of Red Bird and to enjoy more of her work! She also has an Etsy shop. those bad bad beads, a photo by megan_n_smith_99 on Flickr. 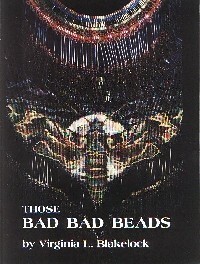 Those Bad Bad Beads by Virginia Blakelock is a hard to find classic. It covers: how to construct a beading loom, weaving techniques, finishing and fringes, making necklaces, bracelets and belts, peyote stitch, african beading techniques, broad collars, bead netting, beading on clothing, and beaded bags. I have a copy available now on eBay. I also have some other hard to find beading books, and some hard to find doll patterns, such as patterns by Ellise Peeples. Plus some awesome zines! I am struggling to make this post interesting, though the truth is I have a cold and am about to crawl under the covers with a book. I actually did paint a little today and shall soon have some new art to show you. violin I, a photo by megan_n_smith_99 on Flickr. I don't have any new art to show you today, though i am working on some things. i have a new idea and i am struggling a bit to figure out how to bring it to life. here is something from the archives - a violin i painted. it's acrylic paint and inks. It's still playable though I don't have strings or pegs on it. And actually it's 3/4 size which would require a little adjusting for me. I am not sure if my fingers are quite small enough to play it with dexterity! It's more intended as a work of art and it's hanging on my wall right now. I have another full sized one I should paint -- it needs to be sanded down. I've also considered painting my student violin, though it's in a friend's attic at the moment. I am hoping to get some art time in today! I've still been listing some more interesting things on eBay including some hard o find patterns, beading books, other art books, and limited edition prints by Audrey Kawasaki. And in related news my job hunt continues! 011608ac1, a photo by megan_n_smith_99 on Flickr. happy valentine's day. life is short, buy yourself some chocolate. Yeti, a photo by megan_n_smith_99 on Flickr. Well, today I had the pleasure of going to my little friend Finn's 2nd birthday party. He got some pretty nice gifts. I think his favorites were his toy tools and a slide. 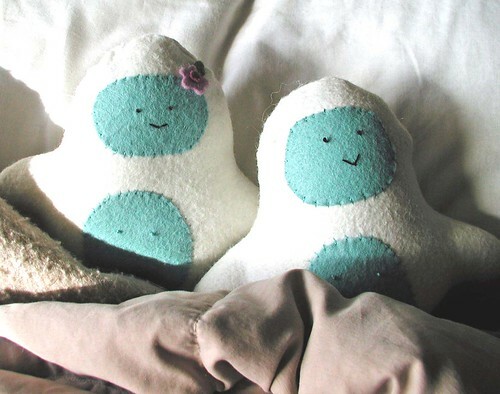 I made these 2 stuffed yeti for the occasion. The one with the pink flower is a girl - for his sister. They are about 6" tall. I made the pattern up myself, it was fun. In The Beginning, a photo by megan_n_smith_99 on Flickr. This is my latest watercolor. In the Beginning. It's the earth's first dream of spring. 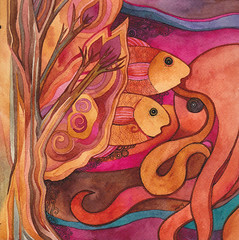 It's 5 x 7 inches, watercolor and colored pencil, and available on Etsy. Yesterday I got little things done and should have felt accomplished but not sure i do. I finished this painting, made 2 toys for gifts, listed a bunch of books on eBay, and wrote the outline for a book i am working on. You should check out my eBay auctions here. Some are ending in a few hours too. Lots of japanese craft books, out of print embroidery books, quilting books, and 2 lots of The Studio Zine and other zines by Teesha Moore. Today I am off to a birthday party for my favorite two year old but I hope for some art time this evening. Red Tea Dragon, a photo by megan_n_smith_99 on Flickr. I have been trying to get in touch with Cynthiacc, the winner of the February give-way. Cynthia, could you email me your address? Every page of my website has an email link: www.megannoel.com. Yesterday was a good day. My mother and I went out to brunch and then I helped her with her crocheting. At least I hope I helped. She was working on some freeform knit / crochet. If you don't know what that is you should check out Prudence Mapstone. I got to meet Prudence once when she was a guest at Seattle Yarn, and she was just as charming as one might hope. 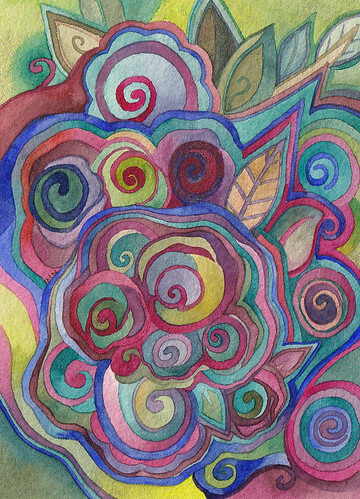 Yesterday evening I painted while listening to A.S. Byatt's The Game. When I was a teenager I drew dozens of dragons in colored pencil. 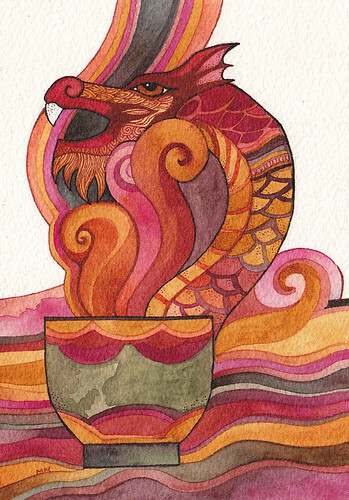 They were inspired by Chinese dragons, rather than European dragons. Chinese dragons as associated with luck and water and are very colorful- while European dragons are drabber and seem to be associated with greed and power. Perhaps I am biased or read too much Tolken at a young age. Two of my dragons are on Etsy. Enjoy! Also I have some eBay auctions for craft / art books (including some out of print rarities and some Japanese craft books) which you can see here. 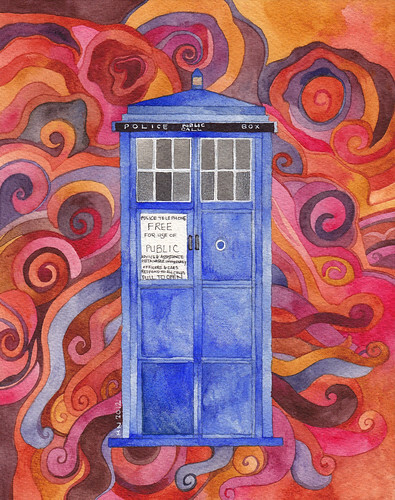 Tardis, a photo by megan_n_smith_99 on Flickr. Well, I did not watch the Super Bowl. I am not sure who played. But what I did do yesterday was finish this painting. It might lead to a series, particularly if there is interest. I sort of envisioned it as the Tardis traveling through .. well, whatever fold or wrinkle in time, worlds, and reality that the Tardis travels through. However I am not sure if I really conveyed that or not. It was at least my intention. 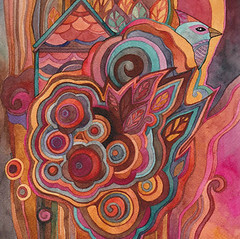 It is 8 x 10 inches and is available on Etsy. I've been reading bios lately. Sometimes I like to sort of lose myself in someone else's life. I guess it is as close as you can come to imagining how another person feels in their skin. The most recent was Half Broke Horses by Jeannette Walls. I quite enjoyed it. I highly recommend it to anyone who likes bios, or is interested in the history and geography of texas or Arizona, or to anyone interested in what it was like back in the homesteading days. She calls it a "True-Life Novel." It's based on the life of her grandmother, Lily Casey Smith, and she's written it from her grandmother's perspective which is why she decided to call it a novel, as she had to sort of imagine some of what her grandmother thought and felt -- maybe not too much though, Lily was a woman who spoke her mind. Lily was a gun-toting, horse-breaking, poker-playing, airplane flying school marm. A character you'll never forget. The winner of the February give-away is Cynthiacc. For the rest of you, you will have another chance next month. I do one give-away a month, around the beginning of the month. Chrysanthemum Tea, a photo by megan_n_smith_99 on Flickr. 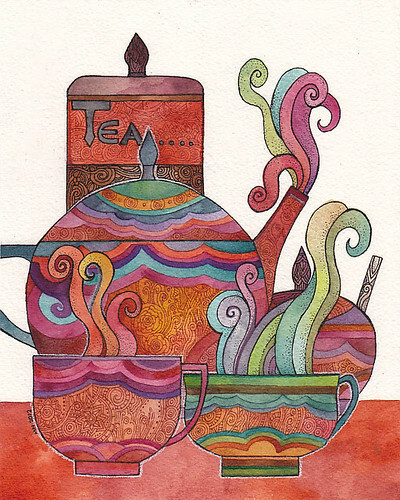 This is another painting in my Tea Steam Dreams series. 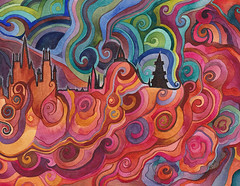 It is 5 x 7 inches and is listed on Etsy if you are interested. I also just listed a bunch more cool craft books on eBay. There are some good books if you are interested in needlework, dragons, embellished dolls, etc. Also I've listed some more Japanese craft books. Yesterday was so beautiful, sunny and lovely. Every once in a while we get a few days like this in February, which is probably the only think that keeps most of us in Seattle going. I think I am going to go to the park with a book and my knitting soon. I wish I felt better because I kind of want to make some sort of social plans but I've felt fairly poorly for I think 3 weeks now? Fortunately it's auto-immune so I can't give it to anyone else but it keeps me laid up. Oh well, at least I've got a nice park 5 blocks away and later this afternoon my balcony will get some sun. I like to toss my sheep skin out there and read. It's kind of tiny so I have not got any chairs out there but a sheep skin is good padding. The smell of wool and lanolin make me feel kind of nostalgic because I grew up on a sheep farm on Vashon Island, it's so beautiful out there. Green Tea, a photo by megan_n_smith_99 on Flickr. 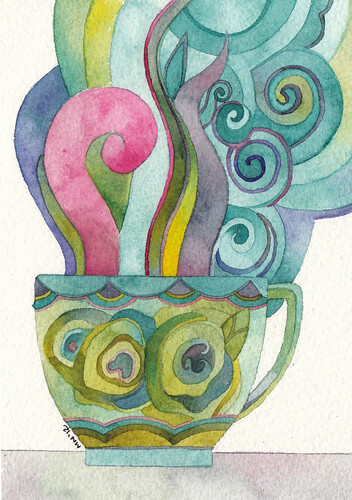 I've listed two more paintings from the Tea Steam Dreams series on Etsy! I've also started listing some art and craft books, including a lot of OOP books and japanese craft books on eBay. I started watching MI-5 yesterday. It's a British spy series. It took me a couple episodes to get into it but I really like it. Matthew Macfadyen is really good and the first season has had some delightful cameos - Hugh Laurie and Anthony Head. My twin sister is a writer and she writes these really interesting blog posts but I find I usually can't think of much to say, I am much more visual - My blog posts are sort of built around my art, and I guess my life and identity are sort of built around it too, so I hope you'll excuse my focus on pictures - they are worth a thousand words, right? Sweet Orange Tea, a photo by megan_n_smith_99 on Flickr. 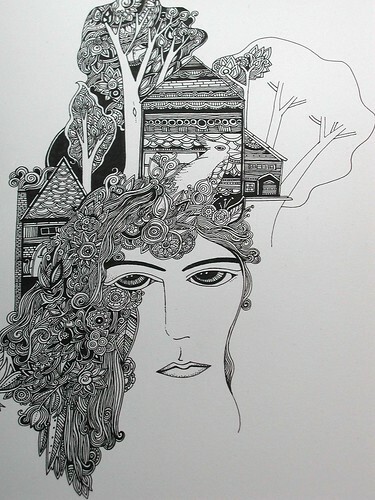 Would you like to win an original piece of my art? Once a month, usually around the beginning of the month, I offer a chance to win! 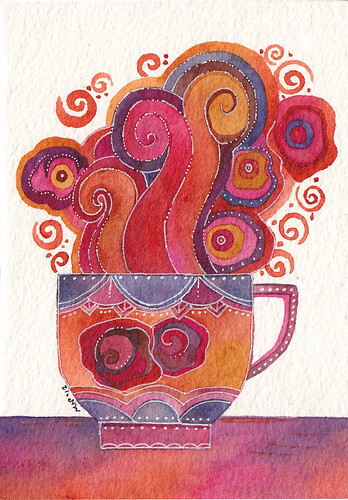 Sweet Orange Tea, 4 x 6 inches, is this month's offering! Leave a comment here for a chance to win. I will draw the Winner on Sunday February 5th. 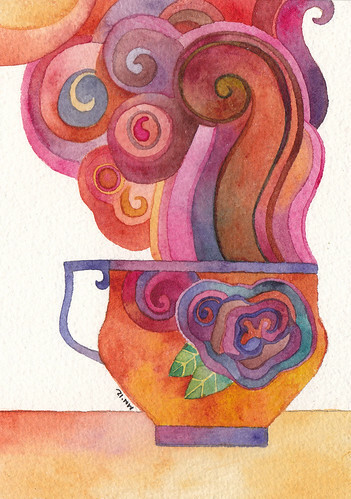 Also, visit my Etsy shop to see more paintings in the Tea Steam Dreams series. Sweet Strawberry, a photo by megan_n_smith_99 on Flickr. 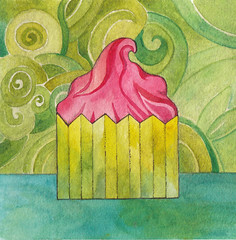 I actually have 2 new series I am working on, Tea Steam Dreams and a series of cupcakes! I may be adding other desserts to the cupcake series, we shall see what inspires me. 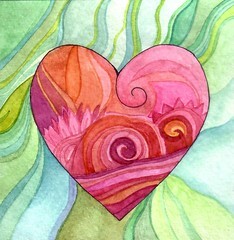 I could certainly use some bright spots of color to get me through February. There are actually some sunbreaks at the moment but February in the NW usually seems to last approximately forever! Which is ironic, really. Did you know that in the UK cupcakes are sometimes called fairy cakes?